Northampton Trustee Fund - Contact us. 11 Greenhills Close, Northampton, NN2 8EN. Further progress on the school extension. The new school extension is making progress. Completion is expected in late November-early December. Another group of students from The Kingswood School will visit in February 2012. They will take part in the opening ceremony. New School Extension taking shape. The extension to the new school is now taking shape! 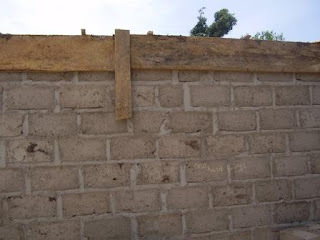 These photos show the walls which are nearly complete. The next step is the roof. This will start after the first rains in November. The rainfall will help settle the walls! Completion date is predicted to be December. The children, staff and parents of Moulton Primary School on the outskirts of Northampton have made a brilliant donation! Back in March 2011, Andy spoke to the children in a school assembly just to update them on what had been going on in Penyem. The school sponsors a child, Mai Kolley. The children were keen to repeat a coin collecting fundraiser that they did 3 or 4 years ago to pay for Mai's education. Today, we are delighted to announce that the grand total of 1p, 2p and 5p coins (and others) comes to £786.83! This is a fantastic effort. The money will be used to fund the building project at Penyem School. Northampton Trustee Fund is a registered UK charity run by Andrew, Anne and Laura Butler. We are all teachers in Northampton. In 2004, Andrew and Anne visited The Gambia for a holiday. The rest - they say is history! To cut a long story short, we linked up with a local tourist guide called 'Ten'. He was a native of Penyem Village. He coached the village football team, and asked for us to supply the team with a football kit. From this we moved onto a 4x4 vehicle for the village to use as an ambulance/community vehicle, medical equipment, school equipment, lego, board games. In 2007 we successfully renovated the village water system in partnership with Friends of Penyem a US based charity. Each year we aim to make a significant financial input to village funds. In return the village has given us an area of land which we have named Little Northampton. This land is used to grow maize which is given to the school children for breakfast. In 2007 we embarked on our biggest venture in seeking sponsors for children to be able to attend school. We are now entering our second year of this scheme and have 75 sponsored children attending school! Since then we have embarked on numerous projects - read on! April 2011. Update! Fantastic News! The school fees for the 77 sponsored children were due in April. We are delighted to say that nearly all the fees were received by return of post! During Easter Andy returned to The Gambia to pay the fees into the NTF account so that Chief Kolley can pay the fees to the schools. During the visit I visited Penyem twice. On the first occasion it was a 'normal' school day at the school. I arrived unannounced as a surprise. The children went absolutely potty!! It is good to go to Penyem like this to see the village going about it's normal daily business. I can confirm that everyone appears as happy as they do on prearranged visits! The second visit to Penyem was with a colleague from the Kingswood School, Faye and her partner James. They were on holiday in The Gambia. They were received by the villagers in the usual way and were made very welcome. The main reason for the visit on this day was to lay the foundation stone for the extension to the school. After some frenzied fundraising in the short time since returning from the school trip in February, we can announce that NTF is funding the new school extension. This will comprise of two classrooms and an office for Chief Kolley. One of the classrooms will be used as the resource centre as The Andre Butler Dream Corner room is now full to overflowing. Avid followers of our work in Penyem will remember that when we first visited the school the resources consisted of one table of old books and knitted toys! Now we are building a whole new room! When the building is complete Chief Kolley will move from his office in the Health Centre, hence freeing up the room in the centre for development. In the photograph on the right we are eating lunch in the Health Centre waiting area. In the background you can see a some toys. To the right is Chief Kolley's office. The plan is to build a wall across that end of the waiting area. This will form a room large enough for 3 beds in a ward. Chief Kolley's office will be retained but converted into a side ward for special cases which need privacy. Hopefully work on this can start when the school extension is completed and funding has been sourced. Back to the school...........The extension will start immediately. It will be done in 4 phases. Phases 1 and 2 have already been paid for. They are the construction of the walls and the roof. Phases 3 and 4 - the floor and decoration will need to be funded by NTF, although we have asked the village to do what they can to cover the costs of decoration (£400). We feel it is important that the people make the effort to still do things for themselves rather than be completely reliant on NTF funding. So we are continuing our fundraising efforts. 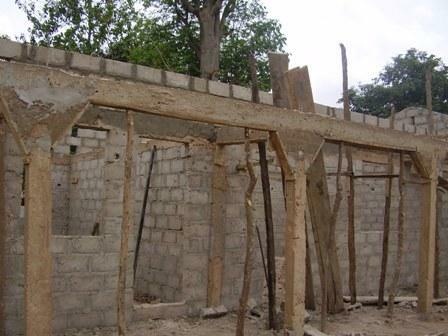 We would estimate to complete the school and the Heath Centre projects we need to raise an additional £2500. It is dangerous to single out people and organisations who are supporting our work. The most important people are you our sponsors. Thankyou. Moulton Primary School deserve a special mention for collecting over £700 in coins - a brilliant effort! Mark Evans at Imerja for providing a laptop and printer for the doctor - thanks. Also for everyone at Thomas Cook and Thomas Cook Airlines for their support. Thanks to everyone! We had a quick visit the Busura Primary School. This school takes children from Penyem for their middle years of education. 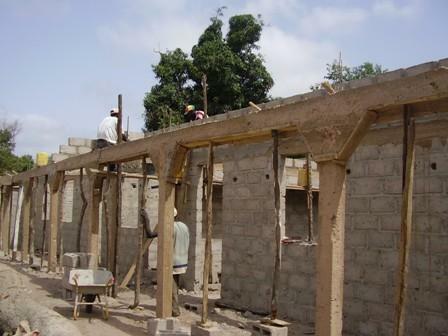 Last February we opened the re-roofed classroom block. The photograph on the right now shows the welcoming entrance to the block. We are pleased to say that Mr Darbo, the headteacher, has sourced new furniture for most of the rooms and they are fully operational. In one year 6 class (normally for 11 year olds) we noticed that one of the students was 17 years old. This is how the system works in The Gambia. Children are placed in classes according to the amount of schooling they have had! And so another visit came to an end. During my stay I was made so welcome. Our agent Dan Nyang is working very hard for us out there, as is our friend Andrew Gomez. If you feel you would like to get involved with NTF, please get in touch! ‘Smiles on your faces!’ - February 2011. I have just returned from a week to remember in The Gambia. I have had many fantastic days out in Penyem, but in this week the days seemed to come all once! Anne couldn’t go this time – see the footnote at the end of this and you will understand why! From previous newsletters and blogs, you will know that this trip involved taking another group of sixth form students from The Kingswood School, Corby. These students were brilliant – I simply cannot say anymore! With us was, David Tristram, Headteacher of Kingswood and Mark Evans from Imerja, one of our key sponsors. Mark was accompanied by his wife Kareena and two young sons Josh and Toddy. We must not forget Sarah, Eve and Kev - our ‘social representatives’! The main focus of the visit was to be part of the official opening of the two projects undertaken for the last year, Penyem Health Centre and the classrooms at Busura School. All of the students had been sponsoring a child for the last year, so they would meet the children and their families. We visited Penyem on 3 days. As we sat in our Land Rovers on the way out to the village it occurred to me that in 2004/5 that Anne and I had sat alone in a taxi on our way to Penyem. Now we had a convoy of 5 vehicles! The generosity of Thomas Cook Airlines allowed us all double baggage. This in itself created a problem. We had to hire extra vehicles to move all the donated medical equipment and school materials! It also became clear that storage was needed at the new Health Centre so we had to set about buying cupboards and shelves. Our first day visit to Penyem involved the official welcome and tour of the village projects. 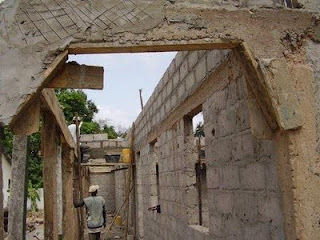 It was then we saw the true value of the work that had gone on in the Health Centre. The building had been transformed from no more than a run down shack, to a proper Health facility. There was a ceiling throughout, tiled floor, electricity and water. To see this was a fulfilling experience. The second day visit was a much busier day. We arrived ready for work. Our task was to help organise the Health Centre. So the cupboards were collected en route from a roadside carpenter and transported with us out to Penyem. It was only then did we realise how generous people had been in donating medical supplies. We laid everything out on tables. Dr Musa Colley was delighted with the specialist items he had requested – examination table, digital thermometers, baby scales etc. The Health Centre has three rooms and a waiting area. One room is the consulting room, another room is Chief Kolley’s office. When we first visited the Health Centre a few years ago, the only medicines they had was a jar of paracetomol. The third room has now become a pharmacy!!! The Health Centre was officially opened that Saturday afternoon by David Tristram and the students of Kingswood. This was after the students had spent time with their sponsored children. Following the opening we were part of the celebrations with drumming and dancing. The day was completed with a football match – Kingswood Girls v. Penyem Girls. Girls playing football is another significant progression in the village. It was fun – even though we lost 3-2! The third day visit took us to the next village of Busura. Last year we had seen that one of the main classroom blocks had lost it’s roof is storms in 2007. Since then it had stood derelict. Most of the children from Penyem attend Busura when the leave Penyem lower school. With the problems with the accommodation at Busura this has meant that the Penyem children can only attend afternoon school. This had involved walking the 5 miles to Busura in the midday heat. 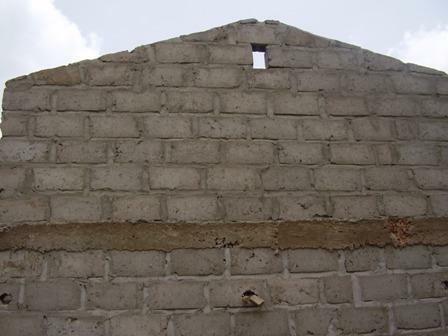 Now that the buildings have been repaired they can go to school at the normal time. The money to pay for this work was raised by the parents, students and staff of Kingswood School with other significant contributions from Northamptonshire companies and organisations. The students took part in finishing off the work to the building by each of them painting the last part of the walls. There is so much that I can add to this account. The visit to Banjul and Albert Market, the Crocodile Pool, the company of the students, the hospitality of the locals, both in the resort and in Penyem. For me, what started in 2004 as a holiday, has now become a business trip – and a very rewarding one too! For you, our supporters and sponsors, Northampton Trustee Fund can only thank you again! Footnote: Special thanks to Chief Kalilu Kolley, Penyem Village Development Committee, NTF Agent in The Gambia Dam Ahmadu Nyang (Dan Da Man) and Andrew Gomez. My Daughter, Laura and Carl for providing Anne and I with a perfect Grandson, Harry Andrew John. Born Saturday 19 February. I was sitting under a mango tree at the time in Penyem!